On Wednesday, Oct, 15, Syracuse University marked National Disability Mentoring Day by collaborating with 43 other local businesses to participate in Disability Mentoring Day 2014 (DMD). 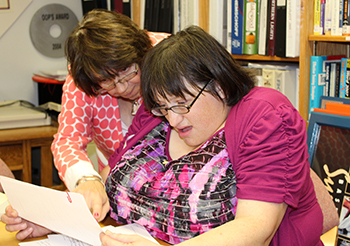 Mentee Angela Palimeri, right, participates in a hands-on clerical work experience in the FIXit office with mentor Linda Flynn at the Carriage House during Disability Mentoring Day. DMD is a large scale-effort to promote career development opportunities for students and job seekers with disabilities through hands on and job shadowing opportunities. The annual event gives people with disabilities an opportunity to learn about different jobs and career fields. The Greater Syracuse local Disability Mentoring Day committee matches mentees to a wide variety of employers in the greater Syracuse area. This year there were 97 opportunities for students/young adults with disabilities to be matched with workplace mentors according to their expressed interest. This opportunity provides mentees with exposure to the work environment and helps them evaluate personal goals, target career skills for improvement, explore possible career paths and develop lasting mentor relationships. The goals are to enhance internship and employment opportunities for people with disabilities; promote disability as a central component of diversity recruitment for a more inclusive workforce; dispel employers’ fears about hiring people with disabilities; and increase confidence among students and job seekers with disabilities. Syracuse University’s Office of Human Resources, in collaboration with Greater Syracuse Disability Mentoring Day Local Organizing Committee, has hosted the Disability Mentoring Day locally for the past several years at Drumlins Country Club. On average, 250 people attend the DMD breakfast, 80-95 employers sign up to be mentors and 80-90 mentees register to participate. Syracuse University hosted 15 mentees at this year’s event. Contact Sharon Cole, HR Employment Specialist, at 315-443-4823 for more information on how to participate in future Disability Mentoring Day events.